Mod The Sims - "Put your homework away properly!" When Sim children get off the school bus, after dancing around and telling everyone about their great grades (if indeed their report card is worth shouting about), they then find a place to put their homework down. If there's already homework lying about because they didn't do yesterday's homework yet, then the new homework gets put on top of the pile. However, I usually play my Sims as good academic children who do their homework everyday, so then they go looking for the closest desk to put it down on. Given the way I generally lay out my Sims houses, this is invariably the desk downstairs in the study which has a computer on it and thus is not somewhere they are then able to place the homework. They give up at this point and put the homework on the floor. This is even though there is a perfectly good desk upstairs in their bedroom. So then I pause the game, go into Buy mode, and move the homework onto the appropriate desk myself. Well - surely we can do better than this? So this object is a desk locator. You place it on a desk or table and have your Sim claim the desk via the menu on this object. Then, next time they come home from school with homework, they will put their homework on their own desk (assuming no homework already on the lot that they stack upon in preference to finding a desk). You can also use it simply as a general location marker for homework to be dropped, by placing it somewhere that isn't sharing a tile with a desk or table, then the Sim will drop the homework on the floor nearby. 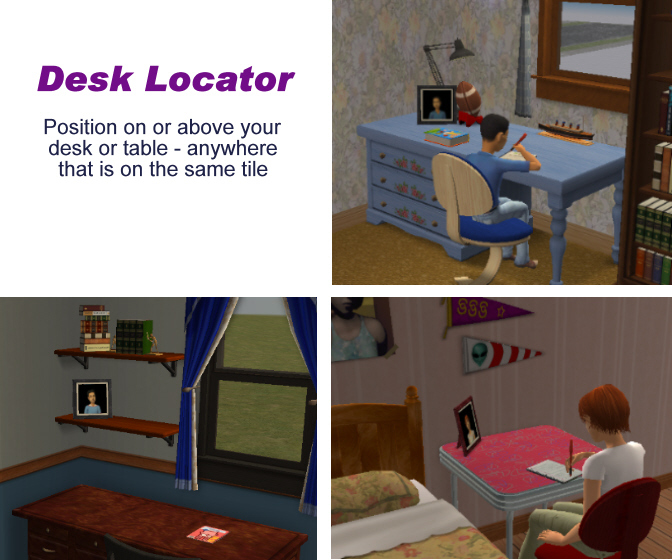 Place the desk locator on the desk or table in your Sim child's bedroom, or upon whatever desk or table you wish them to place their homework. The desk locator doesn't stop the desk or table being used for other things that other Sims need a surface for, e.g. bringing in the mail, or putting down the book they had been reading, but as long as the desk is clear when the owning Sim comes home from school, it will be used to place his homework on. Another excellent idea suggested by melethana is to put the desk locator on a shelf above the desk/table - still on the same tile, but just not actually on the surface. This will also work. This object can be found in Surfaces->Desks. This object works fine with all EPs including Apartment Life. Use the pie menu to claim the desk for this Sim. The photo frame will be updated to contain the graphic representing your Sim. You can only own one desk locator in the house at a time, so if you try to claim another one, the original one will be relinquished. You can claim a desk locator that someone else already owns, changing it to be yours, a pop-up dialog will check that is what you want to do before doing it. This object works with the Base Game without any Expansion Packs, however you don't get the update of the photo to show the owning Sim. This is because that instruction doesn't exist in the Base Game. Instead you get an extra menu "Who owns this desk" and the photo changes to show it is owned (just not who by). Functionally everything works the same way. In the base game, the photo will update to remove the question mark to show it is now claimed, and an additional menu will be available to find out who's desk it is. With any Expansion Pack, the photo will update to show the owning Sim. Either way, you now have the ability to Unclaim the desk. With this download it works for children's and teen's homework. Check out this additional mod which will make it work for University homework (assignments) too. Is this a global hack? Apart from creating this object (which isn't itself a global hack), I have also had to fix/change the way the desk objects allow you to place items on them. They would only allow the placing of objects (by Sims looking for somewhere to put something down) on the left hand side of the desk - I have made a change so that if you try to use the right hand side of the desk it will also work. This change is what makes the object a global hack. Please read Game Help:What are Hacks?/Overrideswiki for more information. Without this change, Sim children would put their homework down on the desk and then when directed to do their homework wouldn't be able to get at it again! This does mean that with this in your downloads folder, even if you don't use the desk locator, the placing of Homework on desks will be much improved. So, apologies for those of you that don't like global hacks, but it is a very small fix. There is certainly the possibility that this object could clash with other hacks to homework. It has been confirmed that this object works fine with the following homework hacks; JenFlower's HomeworkSometimesFasterFun; Twojeff's Homework Sometimes hack; Faster Homework mod; Auto Do Homework Mod and christianlov's Sim Control Tool II. This mod does however clash with Inge's homework patch for use with her Reservable Desk and Ailias's Doing homework by all the family! mod. The pertinent information for the owner of the other object is here. If your object also updates one or both of these, get in touch and we can see about putting them together if it is appropriate to have/use both objects. I have made three additional colours of this object (included in the package) and thus it is also recolourable for your own colours if you want to make any more. Only the frame is recolourable though - since the photo inside the frame is controlled by your use of the object. Fixed a problem that may have caused issues with "cluttered desks", i.e. not finding the desk when searching through the objects on the same tile. Would have manifested itself as not putting homework on the desk (usual problem!). Upgraded the "Sub - Put Homework Down" to be Apartment Life compatible. Will only have any noticeable difference to people playing apartments with desks in common areas and not assigning a desk locator to all their children. The previous version worked well with Apartment Life apart from these cases. Fixed the object so that it could be placed on AL Shelves. Fixed the object so that it could be placed on AL Shelves and on OMSP objects, previous fix broke it for OMSP! If you have a version that does not currently work with OMSP (i.e 17 Jan version), when you re-download you will need to either buy a new version of the desk locator or reset the one you already have (to drive Init processing again). Hold down the <Shift> key and click on the object to bring up the debug menu. Select the pie-menu item called "Force Error"
When the error window pops up choose "Reset"
to turn off that cheat again. Enhanced the desk locator to allow use when placed on a tile that does not also host a table or desk. It will then act as a locator simply for that location, and the homework will be placed on the floor nearby. JohnBrehaut1 for his OMSP objects - without which the 1x1 tables would not have been available for use with the desk locator. melethana for the idea of using a shelf above the desk/table for the desk locator. GeneralOperationsDirector for spotting and testing the fix for using desk locators for locating a floor patch instead of a desk. Check out the Univeristy Mod to allow use of this object with University Assignments.